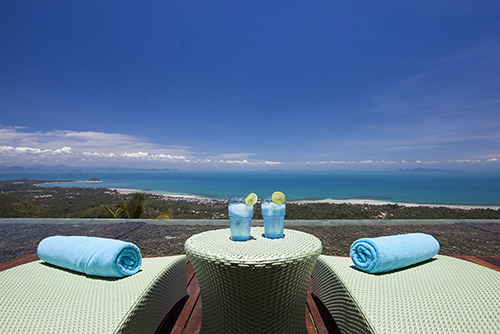 Koh Samui Wedding | an ideal stress free destination for newly-weds. Situated in the crystal waters of the Gulf of Thailand, Koh Samui has attracted millions of visitors since it first made its way onto the global tourist map back in the 1970s. Located just an hour’s flight from the bustling Thai capital of Bangkok, the island is also becoming increasingly popular with couples from around the world seeking to tie the knot in a tropical Thai paradise. Koh Samui’s pearlescent beaches and lush tropical greenery await bride and grooms-to-be, their families and friends, who can all look forward to bringing the wedding to life surrounded by enchanting scenery. The recent addition of a host of private villas around the island also means luxury and comfort remain highlights of a personalised island wedding. Koh Samui is an ideal stress-free destination where newly-weds and their wedding party can combine memorable wedding celebrations with a honeymoon and a memorable holiday, all in a single location. The choice of beaches and activities on offer around the island is vast and with an equally extensive array of private villas now available through established management and rental agencies like Luxury Villas and Homes, couples can choose a venue that suits their needs perfectly. In order to ensure the Koh Samui weddings experience involves as little stress as possible, both on the island and during the time leading up to the big day, it's important to select a reputable wedding planning agency to assist throughout the planning process. Agencies like The Signature Weddings offer bespoke wedding packages in which the couple are able to tailor their whole time in Koh Samui to suit their needs and aspirations, while the wedding planner takes care of the logistics and details. The best companies will have a team of specially trained Thai and Western wedding co-ordinators to work with the couple throughout the process and make sure all of their needs are fully met. This includes pre-planning the event while the couple is still in their home country and then running the event on the day. Wedding planners can also advise on the legal factors involved in the wedding both before and after the couple arrive in Thailand. While some couples opt to celebrate their wedding day within the surroundings of a hotel, an increasing number are choosing the more private and exclusive surroundings of a rented villa. As well as affording more peace and quiet than a hotel based marriage, a Koh Samui villa wedding also offers the chance for the couple to create a truly personalised ceremony and celebration. For example, in a villa the bride and groom are free to totally customise the decorations for the big day, and some even opt to give the villa a distinctly Thai flavour by introducing the traditional blooms such as lotus flower and orchids. 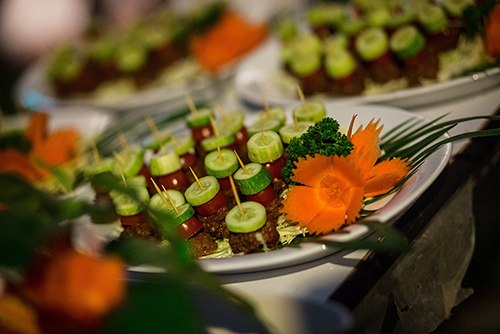 After the ceremony, the wedding party can indulge in a sumptuous feast of traditional Thai dishes, or mix things up with some western cuisine for guests who are in the mood for something with a little less spice. Koh Samui is also a great destination for fresh seafood, and some couples prefer a barbecue around the pool rather than a formal sit down meal. The villas available on the island also offer a wide range of different facilities. Many feature colourful landscaped gardens and either direct access to one of the island’s beaches, to stunning seascape views from the cliffside pool terrace. Couples can therefore choose whether they want to get married within the comfortable surroundings of the villa, in the tropical garden or right on the beach itself.